No matter what the reason—or the season!—when you visit Madison you can count on a great getaway. We are proud of the vibrant culture in our city, and have created itinerary ideas and other tools to help you plan your stay so you can enjoy every experience. Many people know that Wisconsin is considered “America’s Dairyland” but few realize that our roots in agricultural heritage go beyond beer and cheese. In their "Unlikely Foodie Cities" article, Madison was named among other cities, from Baltimore to Greenville to San Antonio, as tops when it comes to what’s on the table. 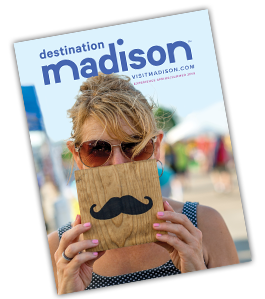 Being located on an isthmus means our downtown is ideally situated between two sparkling lakes—Monona and Mendota. But there are three more to explore: Kegonsa, Waubesa and Wingra. Add in a splash of environmentalist attitude (after all, Aldo Leopold, Gaylord Nelson and John Nolen all called Madison their home at one point or another) and you’ll see why it’s no surprise that NerdWallet ranked us #1 Greenest City in America. Madison’s brand of fresh-air fun doesn’t end with the water. Ours is a big biking city and it runs deep—from the more than 200 miles of biking and hiking trails, to the BCycle bike share program to the fact that we have a bike elevator in our convention center! It’s that kind of culture that gets you named among the “Best Cities on Earth for Biking”—yes, on the entire planet Earth—by Yahoo.com. Having a world-class, public research university in our backyard creates a culture that is coveted by many. More than 40,000 students attend UW-Madison which is known as one of the Public Ivies, meaning it provides a collegiate experience comparable to Ivy League colleges. But our college-town experience is equal parts academics and school spirit. Bucky Badger and his sports teams have been to the NCAA Final Four, the Rose Bowl and countless other championships across more than 20 men’s and women’s teams. But we’re also winning in the media, as seen in USA Today’s #1 in 10 Best College Football Towns ranking.